The Metrobank Foundation, Inc. is now accepting entries for this year’s Metrobank Art & Design Excellence (MADE). Mark Justiniani's black and white portrait mounted beside his winning MADE artwork. With the theme “Unleash,” MADE’s overarching goal is to unleash the “artist within.” The last 35 years saw MADE setting the platform to empower and showcase the ingenuity of the Filipino creative. The MADE Painting Recognition Program is open to all Filipino painters aged 18-35 years old who have not held a solo exhibition. The MADE Sculpture Recognition Program, on the other hand, is open to all professional Filipino sculptors who have staged at least one solo exhibition. Deadline for entries is on May 10. Since its establishment in 1984, MADE has continued to be a platform for discovery for the most passionate and persistent creative visionaries in the country. To date, more than 400 visual artists and design professionals have been recognized, majority of them are now carving names in the local and international art and design scenes. To make the celebration of MADE’s 35th year more meaningful and relevant, MBFI once again stages the annual “Art MADE Public.” The event aims to spread awareness on Philippine art and heritage through a series of exhibits, lectures, and workshops facilitated by renowned Filipino artists as well as architecture and heritage practitioners, in select venues nationwide. 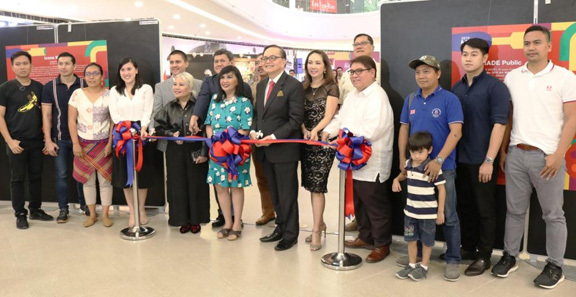 The launching of the 2019 Metrobank Art & Design Excellence was led by MBFI president Aniceto Sobrepeña, SM Supermalls senior vice president for marketing communications Millie Dizon, 1992 Metrobank Annual Painting Competition second prize winner Elmer Borlongan, The Podium mall manager Nona Go Castañes, and United Architect of the Philippines national president Arch. Benjamin Panganiban, Jr. The Art MADE Public kick-off at The Podium featured the lectures “Overview of Arts in the Regions” by Manny Garibay, “Junk Not Creative: Social Entrepreneurship in Design” by interior designer Wilhelmina Garcia, and “Sustainable Tropical Architecture” by Arch. Gelo Mañosa. Meanwhile, the exhibit is divided into three sections: "MADE through the Years," "Icons and Masterpieces," and an exhibit featuring National Artist for Architecture Francisco Mañosa. The “MADE through the Years” walks visitors through a timeline of MADE’s 35 years of implementation, giving them a glimpse into how the program was conceived in 1984, including its milestones and evolutions through the years. 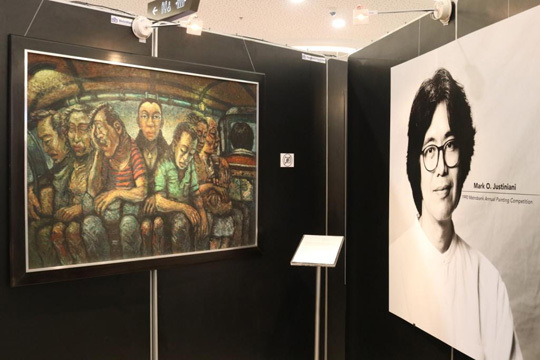 The “Icons and Masterpieces” photo exhibit showcases both national icons and up-and-coming icons in the Philippine art and design community who were past MADE awardees. Alongside their black and white portraits are their MADE winning artworks and designs. Featured artists include Mark Justiniani, Elmer Borlongan, Manny Garibay, Raffy Napay, Mark Andy Garcia, Jan Leeroy New, Yeo Kaa, Arch. Gelo Mañosa, Arch. Jonathan V. Dangue, Arch. Gerard Thomas Joson, and interior designer Wilhelmina Garcia. 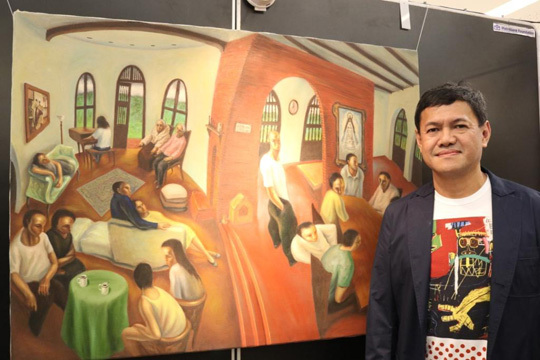 Elmer Borlongan poses with his artwork. The Art MADE Public in ongoing until March 28 in cultural institutions and various commercial spaces at SM Supermalls.